I really dislike food waste, and between trying to be careful not to over cook, using up leftovers and our chickens we waste very little. 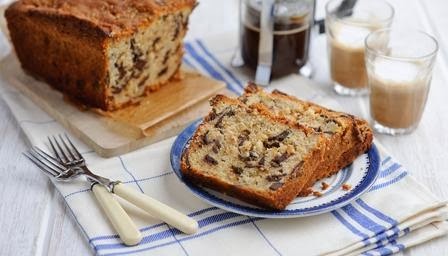 However I am not sad if I find that we have overlooked some bananas, as it gives me a great excuse to make this fantastic cake. Its one of those cakes that everyone wants the recipe for. It was originally a Nigel Slater recipe, but I have changed it a bit. His recipe calls for Hazelnuts, but we are not big not big nut eaters. My kids adore this cake, so we more often than not make it in muffin cases so its easier for lunch boxes. If you make it in muffin cases just remember to reduce the length of time that you cook them for. Preheat the oven to 170C/325F/Gas 3. Line the base and sides of loaf tin with baking parchment. Beat the butter and sugars until light and coffee-coloured. Slowly add the eggs to the butter and sugar mixture and self-raising flour. Peel the bananas and chop them the small pieces. Gently fold the vanilla extract, the bananas and the chocolate chips into the cake mixture, turning gently and taking care not to overmix. Scoop the cake batter into the loaf tin. Dust with a little demerara sugar. Bake for between 1 hour and 1 hour 10 minutes, covering the cake with foil if the top starts to darken too quickly. This cake is well worth a try, and I hope that you will love it as much as we do. Grand re-opening of my Etsy shop!